Just a Little Ink: Just Saying "Thank-You"
This past week, I sent out thank you notes to my Paper Pumpkin subscribers. It's something I do every month for those who subscribe. Just a little perk! I try to use the previous subscription kit to make the thank you, giving another use for the stamps that were in the kit. Here is the thank you that I sent out this month. 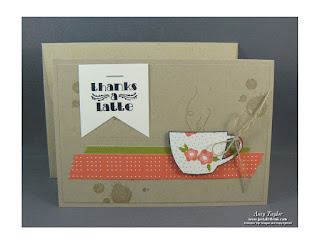 It uses the stamp set from the July Paper Pumpkin kit as well as Gorgeous Grunge and the Pretty Petals paper stack.